I am a specialist in Comparative Translation associated with Indiana University's Russian and East European Institute (REEI). Now retired, I conduct research for publication on topics that interest me. My articles on Tolkien have been published in English in Beyond Bree, Parma Nölé, Translating Tolkien and Tolkien Studies, in Dutch in Lembas (the journal of the Dutch Tolkien Society) and in Russian in Palantir (the journal of the St. Petersburg Tolkien Society). 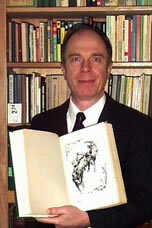 I am the author of A Tolkienian Mathomium , Tolkien Through Russian Eyes (Walking Tree, 2003), Implied, But Not Stated (distributed by Slavica, 1999) and The History of Holland (Greenwood, 1999) to name but a few of my books. I have also written on the Harry Potter vs. Tanya Grotter controversy. I am a graduate of the Russian Advanced Course at DLIWC. I speak Dutch at home. Marvel Comic books, Beetle Bailey , Charlie Brown , Pogo , Peter Pan , Robert Lewis Stevenson, Jules Verne, Isaac Asimov, Arthur C. Clarke, James Blish and Ian Fleming. How did you first get interested in Professor Tolkien's works? One of the reasons that I am fascinated by The Lord of the Rings is that things that you read when you are growing up have an impact on you that is far greater than the impact of things you read when you are older. I first read The Lord of the Rings when I was 18. I was in language school at the time, learning Polish. I spent almost as much time looking up words in The Lord of the Rings as I did looking up words in Polish. One of the instructors suggested that I should get a translation of The Lord of the Rings, and then I would only have to look up the words once. He was right. It did help me build my vocabulary in both English and Polish, and since in several other languages. A Tolkienian Mathomium is just the logical outgrowth of that simple suggestion, made all those years ago. You have to know what the words mean to understand the story. I'd like to talk about your book, A Tolkienian Mathomium. What prompted you to write the book? I did not actually start out to write a book. In the beginning, I only set out to write a single article that would scratch an intellectual curiosity about a single word. That was so much fun that I decided to write another, and soon it got to be like that commercial for potato chips that says “I’ll bet you can’t eat just one.” What turned the articles into a book was a suggestion from James Dunning—who did some of the art work featured in A Tolkienian Mathomium, and is one of my test readers—to make a book out of all the articles that he had read. Publishing the book, by the way, did not put an end to my research. It just wrapped things up in a neat package that others could read. Since the book came out, I have written at least a dozen new articles, including one that explains the name Tom Bombadil, one that explains the word leechcraft, and one that looks at the name The Ivy Bush. Beyond Bree is usually receptive to my articles and some of them will appear there in the future. A start-up academic journal on Tolkien is interested in my article on Tom Bombadil. When looking up the word Mathomium in the dictionary it does not exist (Tolkien fans do of course know the word Mathom); how did you come up with this title? What better title to give a book about a man who made up his own languages than one with a made-up word in it? I wanted the title to sound Latin, because Latin was the language of learning and erudition when Tolkien was going to school. Before university, Tolkien studied at King Edward’s, where “the backbone of the curriculum” was the study of Latin and Greek (Carpenter, p. 37). Waterkeyn. A mathomium is a place where mathoms are stored, which makes each of the articles in the book a mathom. The first article in the book explains the joke behind Tolkien’s recasting of the word. Tolkien’s work is full of humor, if you are a linguist. How do you select words and names to write about? My selection process is rather idiosyncratic. I write about words and names that I come across as I read that have some bearing on Tolkien and his Legendarium. For instance, I came across the name Trotter in The Pickwick Papers by Charles Dickens, and recalled that this was the original name for Strider in Tolkien’s notes. This led me to compare Tolkien and Dickens (“The Leaf Mold of Tolkien’s Mind,” A Tolkienian Mathomium, pp. 117-121). “In League with Miles” (A Tolkienian Mathomium, pp.93-99) was prompted by reading the first edition of the Dutch translation of The Lord of the Rings and seeing that Schuchart translated the word leagues as miles, which causes the Shire to shrink considerably. The article on the place name Stock (A Tolkienian Mathomium, pp. 69-78) was prompted by reading about Seahenge, a pre-Christian religious site near Norfolk. My as yet unpublished article on Leechcraft was a reaction to a comment in Allan Turner’s Translating Tolkien. My article on corpse candles was a response to an article on the same topic in Tolkien Studies No. 2. What special qualifications do you have for making this study? What makes you different from your colleagues? I am a linguist who laughs at Tolkien’s low philological jests, and who plays the same kind of word games himself. To the dismay of Dutch speakers of my acquaintance, when I hear the word boodschappen [errands], for example, I picture a boat full of sheep, as if the word was spelled *bootschapen, and I pronounce it that way on purpose for the fun of it. [boot = boat, schapen = sheep] Some of Tolkien's philological jests were equally as droll. Tolkien said that the linguistic invention that became Middle-earth was an idiosyncratic enterprise, which he undertook to satisfy his own private linguistic taste. He was not surprised that most analyses of his work went awry because “linguistic invention” is a “comparatively rare” art form, and most analysts had little understanding “of how a philologist would go about it” (L.380). He continued that analyses of his creations “appear to be unauthentic embroideries on my work, throwing light only on the state of mind of their contrivers, not on me or on my actual intention and procedure” (L.380). Since Middle-earth is located--to paraphrase Rod Serling’s introduction to The Twilight Zone--'in another dimension, not of sight and sound, but of mind,' its artifacts are the products of the mind; words and names, rather than skeletons, pottery shards and flint tools. The literary baggage of each word and name in a language is built up out of all the usages of that word or name to which a reader has ever been exposed. Tolkien called this "the leaf mold" of one’s mind (Carpenter, pp. 140-141). The purpose of A Tolkienian Mathomium is to offer the reader a glimpse into the literary baggage that I carry around for the words that make up Tolkien’s Legendarium. It is hoped that the explanations presented there will, to some extent, coincide with Tolkien’s literary baggage and/or motivation for creating a word, but, at the same time, I recognize that Tolkien was correct when he said: “there is no substitute for me, while I am alive” (L.380). Since Tolkien is no longer alive, I hope that, being a linguist, I can provide a philologist’s insight to a difficult and interesting text. The book now reaches its second printing; did you change anything? There are now six fewer typographical errors than in the first edition. To write the study, do you work alone or do you have help from others, like for example: Christopher Tolkien or Wayne Hammond? I work alone, using sources that are contemporary with Tolkien. I find that a lot of the problems that people have understanding Tolkien come from the fact that they are trying to read him from a strictly modern point of view, while Tolkien was purposely seeking to create a recognizable historical background, based on the reality of his own time and the ancient literature that he loved. The relationship between Sam and Frodo is a good example. Sam was Frodo’s servant, but these days master-servant relationships are not politically correct and some readers seek to place another interpretation on it. In cases like this, some diachronic translation is necessary for the modern reader to understand what is going on, and that is where sources contemporary with Tolkien come into play. My diachronic analysis of the relationship between Sam and Frodo was published as “Frodo’s Batman” in the first issue of Tolkien Studies. What does your book reveal about Tolkien the man or his works? Tolkien had a great sense of humor, but most people can’t see it because of the fact that it is a linguist’s sense of humor, the kind that, generally, only another linguist will laugh at. It also shows the encyclopedic depth of Tolkien’s knowledge and of his story. The story seems real because the depth of the backstory implied by the names and place names and other Tolkiennyms that decorate the story. They all really meant something to Tolkien. You don’t have to understand them all to appreciate the tale, but it helps. A Tolkienian Mathomium offers the reader an explanation of some of them. Having written all these articles, do you have insight why Tolkien has been so popular with readers? Tolkien addressed the general human condition, speaking directly to those who believe in heroes and responsibility, in the concepts right and wrong, and who struggle with the choices that they have to make each day. This is why The Lord of the Rings was banned in the Soviet Union. The idea that a single small Hobbit can decide the outcome of a global battle between Good and Evil is ideologically dangerous in a closed society based on collective rather than individual action, as was the case with the Soviet Union. Tolkien speaks to the best part of every reader and makes them think that they too could rise to the challenge presented to the Hobbits. It is imbued with a hope that we might actually be victorious over the ills and evils that beset us. So why has Tolkien been so unpopular with the critics? Because Tolkien broke the mold of what was considered “Great Literature,” and wrote for an audience of one: himself. He by-passed the gatekeepers who thought that they defined the standard of Literature, and they were not pleased at having been ignored. What remains unique in Tolkien's work? I'd like to talk a bit about the actual process of writing. Do you have a special system for research and organization? I always start with the Oxford English Dictionary. From there I look up how the word or name was handled in the translations of my acquaintance (9 Russian, 2 Polish, 2 Dutch, 2 German, 1 Czech and 1 Bulgarian). Following that, I consult British history and folklore in sources contemporary with Tolkien. Excursions into English Literature, genealogy or toponymy are added as needed. The primary focus of my research is the word/name and the context it was used in during Tolkien’s lifetime. I write in an office in the back of my house, looking out a window with a view of the campus of Indiana University. I do most of my research in the windowless tower that houses the stacks of the university’s excellent library. Once you get inside the tower there is nothing to distract you from following the books wherever they may lead. Did you have to travel much? No, but I do spend quite a bit of time in the library, letting books take me to different times and places. I like to watch old black and white movies, to travel and to walk. This month at home we are having our own Fred MacMurray and Claudette Colbert movie festival. One final question. What do you think about the Hobbit movie?